If you run a small business selling products, download this Free Sales Invoice Template and create invoices easily in Excel. You can create unlimited invoices and manage them all in one file. You can save time by storing your products and customers once and re-using them for invoices whenever needed. The template is designed to accommodate 20 line items per invoice. If you are new to Excel Tables, please read the article on how to use Excel Tables for data entry. You can add columns or rename existing columns as you need. You can add more products anytime. You can add columns or rename existing columns as you need. You can add more customers anytime. Right Click on the logo image and choose ‘Change Picture. Select an image from your computer to replace. If you don’t need a logo, just select the logo image and press the Delete key. It’s easy to customize the appearance by selecting which field should appear. 7 fields can be customized. The list of information available in the drop down is based on columns in the Customers sheet. Enter Tax Rate in cell I50. You can change this later for each invoice if needed. The template comes with no currency formatting by default as I would like the template to be useful in all countries. It’s easy to apply your currency. In the Invoice sheet, press Ctrl+G. This opens a new dialog box. Choose CURR and click OK. This will select all the cells that need to be formatted as currency. Press Ctrl+1. After selecting and pressing OK, the invoice will have currency format applied. With our initial setup complete, it’s time to create our first invoice. First, let’s make a copy of the Invoice sheet. Rename the new sheet with the Invoice #. For example, for Invoice #1234, Let’s name the sheet 1234. Now, we will create the invoice #1234. Press Ctrl+P to preview & Print/export to PDF. 1. Enter Invoice # in cell J15. Other customer information will automatically populate. Choose Product ID from the list. Description and Unit columns will automatically populate. If you would prefer some other attribute (or information) of products instead, you can just change it. How cool is that? Enter Quantity and unit discount. The Price, Taxable and Amount will automatically populate. You can choose to display either Amount Before Tax or Amount After Tax. Continue entering products as many there are in the invoice. The maximum allowed is 20 in this template. As we scroll down, we see the subtotal and total section. Here, we have two options. Enter Tax Rate% in cell I50. Next is Discount, where we can choose to use Discount Amount or Discount %. If you choose Discount %, enter the value in decimals. For example, 0.01 for 10%. If you do not want to display any discount, just clear the cell. Enter Other Charges, if any, in cell J53. You can rename Other Charges to anything that applies. For example: ‘Shipping Charges’. Enter any comments or notes in cell C51. After reviewing and making sure everything looks good, it’s time to print or export. Press Ctrl+P to preview print. The page is set up to be print-friendly. So, you should be able to just print as it is. To export to PDF, select the Export menu option. In the following window, choose a location in your computer to store the PDF file and give a name to it. Tip: use your invoice number in the file name. Save all your invoices with the Invoice Number in the PDF file name in the folder. Thus, you will be able to easily identify a specific PDF if needed in the future. What if you sell hourly services? You can also use this template for services that you may charge hourly. In such cases, you will enter the number of hours in the Quantity column in the invoice. In the Products table, you will enter the Service name and provide the hourly rate as the Price. What if it is consulting projects and not hourly? You can also use this template if you work on consulting projects. You can enter your Project ID in the ID field, Project Name in Name field and enter Project description in the Description field. You can enter the project’s cost in the Price field. You can enter Quantity as 1. What if you want to use Product Name instead of Product ID as unique identifier? You can choose to user Product ID or Product Name or your own field as key identifier of products. Just select the field in cell C28 in the Invoice sheet. Now, you can enter. If you choose Name, the drop down list automatically will use Product Name instead of Product ID. Everything works smoothly. How can I change the colors, fonts or other formatting? All the formatting options are available to you. Just select the cells you need to modify format and use Excel’s default formatting options (in the Home ribbon) to change fonts, colors, appearance, number format or alignment. If you change the font size or font, you can adjust the column widths and/or row heights to ensure that the print view is good. How to sort data in Product list? When you have a lot of products, it might become challenging to choose from the drop down menu in the Invoice worksheet, especially if the product IDs/Names are not sorted. By default, the order in which you entered the products in the Products table will be used as it is in the drop down menu. That means you could sort the products in the Products table and this would automatically give you sorted products in the drop down menu. This should help you in easier selection of products in the invoice. I forgot to mention that I am based in Mombasa, Kenya, in my earlier comment. 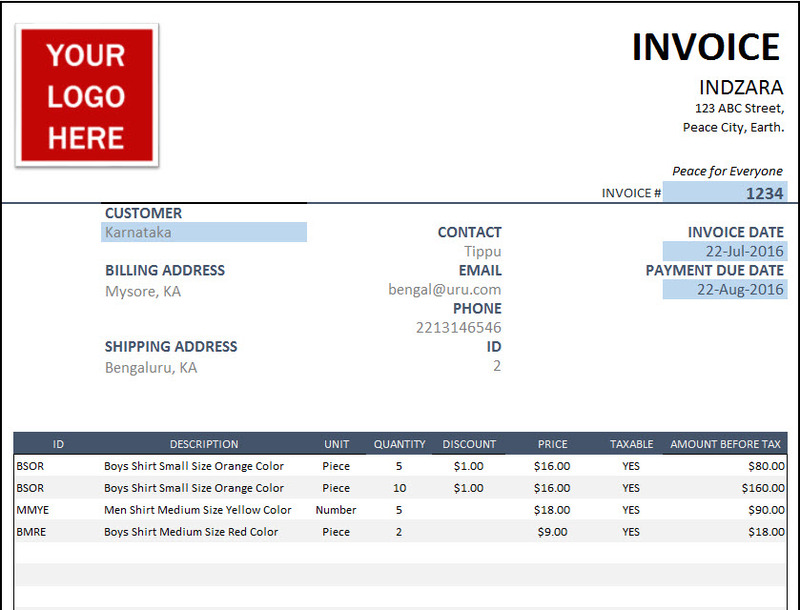 All the details required to create and start using the invoice template are ready. But I am still having the problem of sequential invoice numbers on each new invoice. I need to get the invoice number issue sorted out so that i can start using it. If you can get me a paid version with the above requirement then I will glad to purchase it from you. This is the only invoice version which i have come across which fits my requirements. I shall highly appreciate if you can reply to my email.